A Birkeland current is a set of currents that flow along geomagnetic field lines connecting the Earth’s magnetosphere to the Earth's high latitude ionosphere. In the Earth’s magnetosphere, the currents are driven by the solar wind and interplanetary magnetic field and by bulk motions of plasma through the magnetosphere (convection indirectly driven by the interplanetary environment). The strength of the Birkeland currents changes with activity in the magnetosphere (e.g. during substorms). Small scale variations in the upward current sheets (downward flowing electrons) accelerate magnetospheric electrons which, when they reach the upper atmosphere, create the Auroras Borealis and Australis. In the high latitude ionosphere (or auroral zones), the Birkeland currents close through the region of the auroral electrojet, which flows perpendicular to the local magnetic field in the ionosphere. The Birkeland currents occur in two pairs of field-aligned current sheets. One pair extends from noon through the dusk sector to the midnight sector. The other pair extends from noon through the dawn sector to the midnight sector. The sheet on the high latitude side of the auroral zone is referred to as the Region 1 current sheet and the sheet on the low latitude side is referred to as the Region 2 current sheet. The currents were predicted in 1908 by Norwegian explorer and physicist Kristian Birkeland, who undertook expeditions north of the Arctic Circle to study the aurora. He rediscovered, using simple magnetic field measurement instruments, that when the aurora appeared the needles of magnetometers changed direction, confirming the findings of Anders Celsius and assistant Olof Hjorter more than a century before. This could only imply that currents were flowing in the atmosphere above. He theorized that somehow the Sun emitted a cathode ray, and corpuscles from what is now known as a solar wind entered the Earth’s magnetic field and created currents, thereby creating the aurora. This view was scorned by other researchers, but in 1967 a satellite, launched into the auroral region, showed that the currents posited by Birkeland existed. In honour of him and his theory these currents are named Birkeland currents. A good description of the discoveries by Birkeland is given in the book by Jago. Auroral-like Birkeland currents created by scientist Kristian Birkeland in his terrella, featuring a magnetised anode globe in an evacuated chamber. Auroral Birkeland currents carry about 100,000 amperes during quiet times and more than 1 million amperes during geomagnetically disturbed times. Birkeland had estimated currents "at heights of several hundred kilometres, and strengths of up to a million amperes" in 1908. The ionospheric currents that connect the field-aligned currents heat up the upper atmosphere due to the finite conductivity of the ionosphere. The heat (also known as Joule heat) is transferred from the ionospheric plasma to the gas of the upper atmosphere, which consequently rises and increases drag on low-altitude satellites. Birkeland currents can also be created in the laboratory with multi-terawatt pulsed power generators. The resulting cross-section pattern indicates a hollow beam of electrons in the form of a circle of vortices, a formation called the diocotron instability (similar to the Kelvin-Helmholtz instability), that subsequently leads to filamentation. Such vortices can be seen in aurora as "auroral curls". Birkeland currents are also one of a class of plasma phenomena called a z-pinch, so named because the azimuthal magnetic fields produced by the current pinches the current into a filamentary cable. This can also twist, producing a helical pinch that spirals like a twisted or braided rope, and this most closely corresponds to a Birkeland current. Pairs of parallel Birkeland currents will also interact due to Ampère's force law: parallel Birkeland currents moving in the same direction will attract each other with an electromagnetic force inversely proportional to their distance apart whilst parallel Birkeland currents moving in opposite directions will repel each other. There is also a short-range circular component to the force between two Birkeland currents that is opposite to the longer-range parallel forces. Electrons moving along a Birkeland current may be accelerated by a plasma double layer. If the resulting electrons approach the speed of light, they may subsequently produce a Bennett pinch, which in a magnetic field causes the electrons to spiral and emit synchrotron radiation that may include radio, visible light, x-rays, and gamma rays. Kristian Birkeland predicted the auroral electrojets in 1908. He wrote p. 95 "the currents there are imagined as having come into existence mainly as a secondary effect of the electric corpuscles from the sun drawn in out of space, and thus far come under the second of the possibilities mentioned above". And p. 105, "Fig. 50a represents those in which the current-directions at the storm-centre are directed westwards, and 50b those in which the currents move eastwards". After Kristian Birkeland first suggested in 1908 that "currents there [in the aurora] are imagined as having come into existence mainly as a secondary effect of the electric corpuscles from the sun drawn in out of space," the story appears to have become mired in politics. Birkeland's ideas were generally ignored in favor of an alternative theory from British mathematician Sydney Chapman. In 1939, the Swedish Engineer and plasma physicist Hannes Alfvén promoted Birkeland's ideas in a paper published on the generation of the current from the Solar Wind. In 1964 one of Alfvén's colleagues, Rolf Boström, also used field-aligned currents in a new model of auroral electrojets. Proof of Birkeland's theory of the aurora only came after a probe was sent into space. The crucial results were obtained from U.S. Navy satellite 1963-38C, launched in 1963 and carrying a magnetometer above the ionosphere. In 1966 Alfred Zmuda, J.H. Martin, and F.T.Heuring analysed the satellite magnetometer results and reported their findings of magnetic disturbance in the aurora. In 1967 Alex Dessler and graduate student David Cummings wrote an article arguing that Zmuda et al. had detected field-aligned currents. Alfvén subsequently acknowledged that Dessler had "discovered the currents that Birkeland had predicted" and they should be called Birkeland-Dessler currents. 1967 is therefore taken as the date when Birkeland's theory was finally acknowledged to have been vindicated. In 1969 Milo Schield, Alex Dessler and John Freeman used the name "Birkeland currents" for the first time. In 1970 Zmuda, Armstrong and Heuring wrote another paper agreeing that their observations were compatible with field-aligned currents as suggested by Cummings and Dessler and by Boström. ^ Le, G.; J. A. Slavin; R. J. Strangeway (2010). "Space Technology 5 observations of the imbalance of regions 1 and 2 field-aligned currents and its implication to the cross-polar cap Pedersen currents". J. Geophys. Res. 115 (A07202): n/a. Bibcode:2010JGRA..115.7202L. doi:10.1029/2009JA014979. ^ Birkeland, Kristian (1896). "Sur les rayons cathodiques sous l'action de forces magnetiques intenses". Archives des Sciences Physiques. 4: 497–512. ^ Schuster, Arthur (March 1912). "(article title N/A)". Proceedings of the Royal Society A. 85 (575): 44–50. Bibcode:1911RSPSA..85...44S. doi:10.1098/rspa.1911.0019. ^ Jago, Lucy (2001). The Northern Lights: How One Man Sacrificed Love, Happiness and Sanity to Unlock the Secrets of Space. Knopf. p. 320. ISBN 978-0-375-40980-6. ^ Fälthammar, Carl-Gunne (Dec 1986). "Magnetosphere-Ionosphere Interactions. Near Earth Manifestations of the Plasma Universe". IEEE Transactions on Plasma Science. PS-14 (6): 616–628. Bibcode:1986ITPS...14..616F. doi:10.1109/TPS.1986.4316613. ^ Suzuki, Akira; Naoshi Fukushima (1998). "Space current around the earth obtained with Ampère's law applied to the MAGSAT orbit and data" (PDF). Earth Planets Space. 50 (1): 43–56. Bibcode:1998EP&S...50...43S. doi:10.1186/bf03352085. ^ Anderson, B. J.; J. b. Gary; T. A. Potemra; R. A. Frahm; J. R. Sharber; J. D. Winningham (1998). "UARS observations of Birkeland currents and Joule heating rates for the November 4, 1993, storm". J. Geophys. Res. 103 (A11): 26323–35. Bibcode:1998JGR...10326323A. doi:10.1029/98JA01236. ^ Brush, Stephen G. (December 1992). "Alfvén's Programme in Solar System Physics". IEEE Transactions on Plasma Science. 20 (6): 577–589. Bibcode:1992ITPS...20..577B. doi:10.1109/27.199495. ^ S. Chapman and J. Bartels, ‘’Geomagnetism,’’ Vol. 1 and 2, Clarendon Press, Oxford, 1940. ^ Alfvén, Hannes (1939), "Theory of Magnetic Storms and of the Aurorae", K. Sven. Vetenskapsakad. Handl., ser. 3, vol. 18, no. 3, p. 1, 1939. Reprinted in part, with comments by A. J. Dessler and J. Wilcox, in Eos, Trans. Am. Geophys. Un., vol. 51, p. 180, 1970. ^ a b Boström R. (1964). 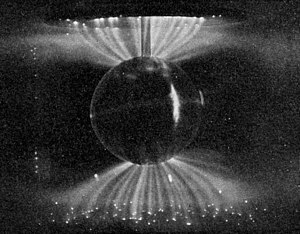 "A Model of the Auroral Electrojets". J. Geophys. Res. 69 (23): 4983–4999. Bibcode:1964JGR....69.4983B. doi:10.1029/JZ069i023p04983. ^ Zmuda, Alfred; J.H. Martin & F.T.Heuring (1966). "Transverse Magnetic Disturbances at 1100 Kilometers in the Auroral Region". J. Geophys. Res. 71 (21): 5033–5045. Bibcode:1966JGR....71.5033Z. doi:10.1029/JZ071i021p05033. ^ Cummings, W. D.; A. J. Dessler (1967). "Field‐Aligned Currents in the Magnetosphere". J. Geophys. Res. 72 (3): 1007–1013. Bibcode:1967JGR....72.1007C. doi:10.1029/JZ072i003p01007. ^ Alfvén, Hannes (1986). "Double layers and circuits in astrophysics". IEEE Trans. Plasma Sci. 14 (6): 779–793. Bibcode:1986ITPS...14..779A. doi:10.1109/TPS.1986.4316626. ^ Schields, M.; J. Freeman; A. Dessler (1969). "A Source for Field‐Aligned Currents at Auroral Latitudes". J. Geophys. Res. 74 (1): 247–256. Bibcode:1969JGR....74..247S. doi:10.1029/JA074i001p00247. ^ Zmuda, A.; J. Armstrong; F. Heuring (1970). "Characteristics of Transverse Magnetic Disturbances Observed at 1100 Kilometers in the Auroral Oval". J. Geophys. Res. 75 (25): 4757–4762. Bibcode:1970JGR....75.4757Z. doi:10.1029/JA075i025p04757. ^ Alfvén, Hannes (1976). Evolution of the Solar System. Washington. D.C., USA: Scientific and Technical Information Office, National Aeronautics and Space Administration. Ohtani, Shin-ichi; Ryoichi Fujii, Michael Hesse and Robert Lysak, editors (2000), Magnetospheric Currents Systems, Am. Geophys. Union, Washington, D.C., ISBN 0-87590-976-0.